TAKEEI Group provides environmental consulting service, which is required prior to handling and dispose of waste. The consulting includes (i) risk analysis of toxic or hazardous materials such as asbestos in demolition works, (ii) analysis of soil contamination and (iii) handling of asbestos and contaminated soil. The Group engages in measurement certification business and analyzes water and drinking water, atmosphere and asbestos. The group companies also measure noise and vibration, working environment and inspect radioactive substances. At TAKEEI Group, sorted waste containers in various types and sizes are available (e.g. 50l bag, 1m³ flexible container bag, bins in sizes 4, 6 and 8m³, etc.). Also available at the Group are different kinds of waste collection and transportation vehicles (e.g. detachable container vehicles, crane trucks, large-sized vehicles, etc.). To support customers' efforts towards eco-friendly waste management, TAKEEI offers a wide variety of proposals on whole procedures to optimize waste type definition, sorted waste containers and sorting method. In the intermediary processing plant, collected waste is sorted carefully and scrupulously by hand and mechanical sorting equipment including heavy machinery. This process raises the recycling rate and minimizes the final landfill volume. The sorted waste is then automatically crushed, compressed and packaged to meet quality standards, thus becoming ready to be shipped as recycled materials and energy sources. Residue of recycling process (i.e. unrecyclable waste) is buried at final landfill sites. 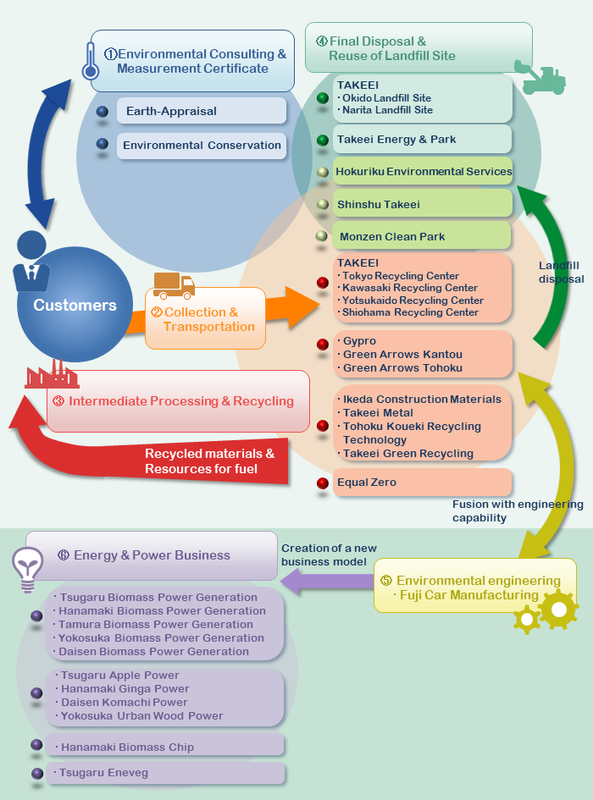 TAKEEI CORPORATION and group companies operate 4 landfill sites in Chiba, Nagano and Ishikawa. These landfill sites are carefully controlled and properly managed to reduce environmental impact and their safe and sound operation is appreciated by local societies. Takeei Group is incorporating environmental engineering capability into operations with the objective of taking the next step forward from waste materials processing and recycling business. In “Environmental Facilities / Environmental Plant,” we are working with waste material and scrap-related machinery centered on RPF manufacturing facilities, shredding plant and other recycle/reuse plant. “Vehicles” include bulk-haul lorries and specialized waste retrieval trucks. Takeei Group will continue to fuse engineering capability with acquired expertise relating to processing of waste materials. With the resulting technological development of new recycling methods, we are also focusing on expansion into environmental business outside Japan. From the core business of waste materials processing and recycling operations, Takeei Group is expanding the sphere of activities and moving into the field of resources and energy. Using timber from forest thinning, pruned branches and other organic materials we collect ourselves, we are engaging in biomass power generation, generating and selling electricity. Takeei Group is endeavoring to develop and expand this business for the benefits it will bring in diverse areas. For example, invigoration of communities and as a solution to regional issues, the creation of employment, local generation of energy for local consumption, answering the need for renewable energy sources, reduction of CO2, and contribution in many other ways to communities and the natural environment overall. Looking to the future, Takeei Group is striving to focus the expertise accumulated in our core business of waste material processing and recycling. We are endeavoring to build accomplishments in power generation business through participation in the waste material power generation sector and other fields. Corporate goal of TAKEEI Group is reduce environmental impact through cyclical reuse of industrial waste. We are aware that this goal is aligned with serious requirements of society. 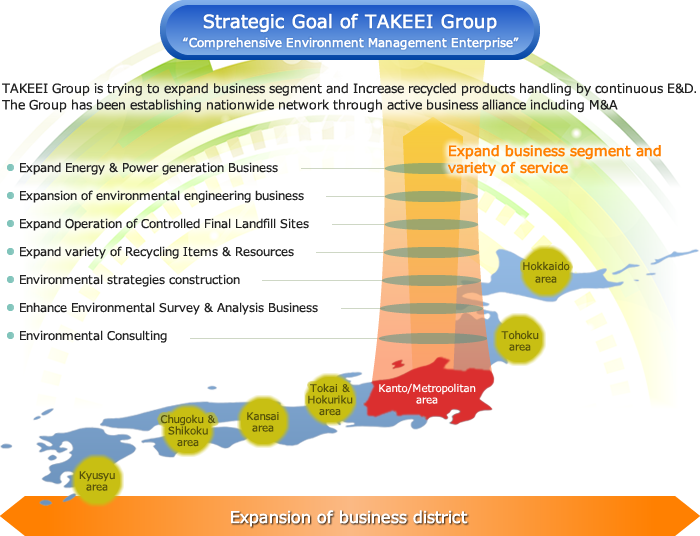 TAKEEI Group is trying to maximize recycled products from TAKEEI Group companies. 396,590t Waste concrete is turned into recycled crush stones by crusher. Earth and sand in the waste are granulated after fine sorting and used by construction companies as roadbed and backfill materials. Ikeda Construction Materials processes and recycles several different sizes of crushed stone and sand products. 62,830t Wood waste is crushed by crusher to standard size wood chips and used mainly as biomass fuel for power generation plants. Recycled wood chips are also used as the material for pulp, fuel power generator or incinerator of manufacturing facilities and used as compost. 34,769t Metal scrap is disassembled and cut into pieces before being sorted into iron/steel, aluminum, stainless-steel, copper and so on. Through the recycling process the metal scrap is reused as ferrous and non-ferrous materials at steel manufacturers and other metal manufacturers. 57,435t Gypsum board waste undergoes recycling process mainly at Gypro, where it is crushed and separated into gypsum powder and paper. Gypsum powder and some of the gypsum board waste are each recycled into materials to be used by gypsum board manufacturers. 41,242t Mixed waste is finely classified through sorting equipment of various types such as wind force separator, vibrating screen and rotary screen. Waste with low specific gravity is sorted and compressed to be handled as combustibles. The combustibles are used as fuel for waste-to-energy plants and incineration facilities with heat recovery system. 26,490t Among the waste plastics and combustibles, those that meet such quality standards as chlorine contents are sorted to be crushed and compressed. These materials are used by cement manufacturers as fuel for their production process. 9,562t Various types of waste paper, including the paper separated from gypsum board waste at Gypro and waste cardboards, are usually compressed into block shapes. The blocks are used by paper manufacturers as recycled material for paper. 6,345t Waste plastics such as polypropylene, polyvinyl chloride, polystyrene and some other specific types of plastic materials are crushed and compressed for volume reduction and solidification. In this way, the waste plastics become ready as recycled materials for new plastic products. 6,361t The dust generated from a plant's waste disposal process is mixed together with other waste and formed to be “Eco- foam”, an additive to control foaming in the revolving furnace in steelmaking process.